I recently received a commission for 2 hats. A fade from light to dark with a small heart and a fade from gray to blue with a moose. The first one was simple! Turned out great and the client loves it! The second one presented several challenges. First I was going to blend the gray and blue then fade to brown with a moose pattern I designed built into the stitches. But the blue/gray combo didn’t pop like I’d hoped for. So I pulled out all the rows and started again. 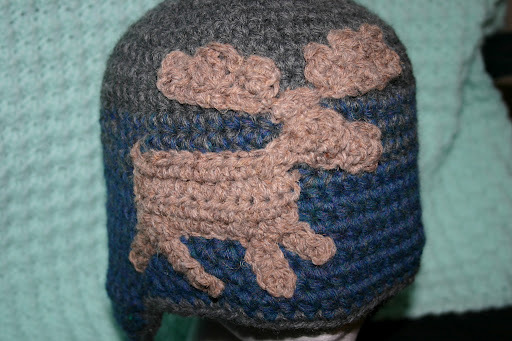 This time with just gray at the top and fade to blue with the brown as the moose pattern stitches. 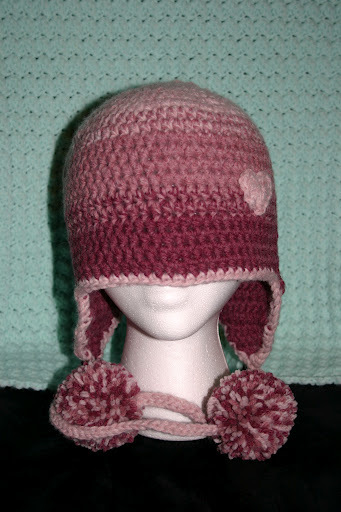 But, in the way of round worked crochet, all the stitches were slanting and didn’t line up! So I pulled it out again! and started fresh. Gray at the top, fade to blue, and finish with ear flaps. 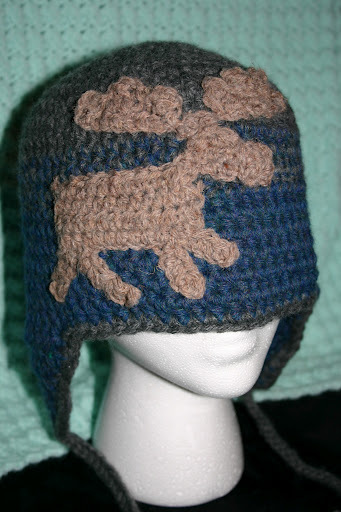 Then I tried to cross stitch the moose pattern into the hat. Epic fail! Pulling the cross stitch out, I decided to make an appliqué of sorts. I crocheted several small pieces and sewed them together to create a moose! Then sewed the moose onto the hat. The end result is pretty good. And the client loves it too! This entry was posted in fun, gray, moose, pattern, pink, rose, warm, winter on December 31, 2010 by littlebirddesignsfxbg. Not too long ago I put up a post about how slow LBD had been. Well, that must have been the trick to start the ball rolling again because it sure has been busy! I received 3 commissions back to back to back! While that is fantastic and I appreciate the business but dang! 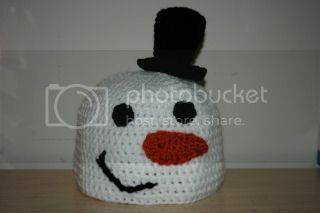 Five hats and an amigurumi bunny later I am finally back to working on my own Christmas presents. Not only do I only have seven days to finish all my projects, but I keep adding stuff to the list! I hope and pray to have everything done and wrapped by Tuesday, but that may be optimistic. Hope you have a wonderful Christmas and a shiny New Year! 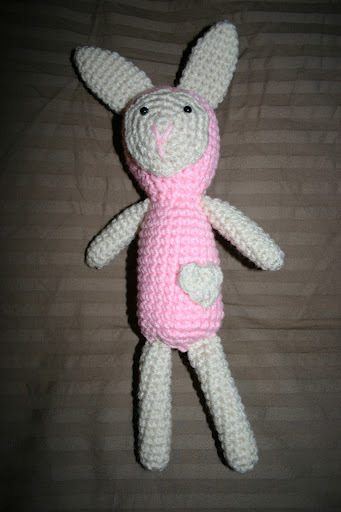 This entry was posted in green, hats, new year, pink, rabbit, red, white on December 16, 2010 by littlebirddesignsfxbg. 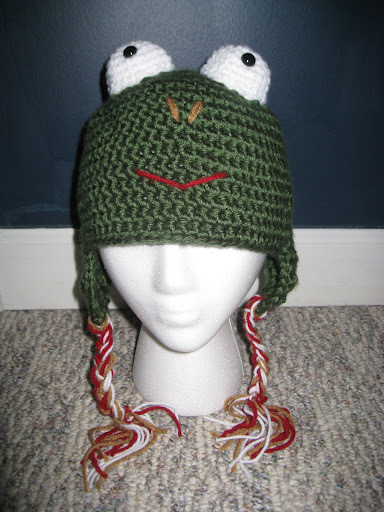 My job was to make ear flap hats that looked like frogs rather than bears. I already knew I wanted big bulging eyes, but other than that I wasn’t sure how to proceed. 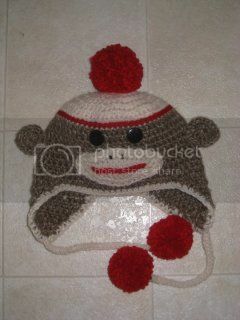 Making the hat itself was simple enough. I have had plenty of practice. The embellishments were the stumpers. 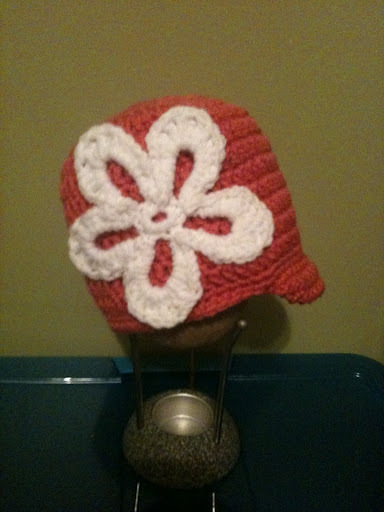 I modified a hat pattern to be super small to make two half balls, or bowls if you will. From there I added little safety eyes and some stuffing. There, eyes done. The nose was easy enough also. Just a little “embroidery” and done…again. The mouth gave me a little trouble. I started with a large mouth but that ended up looking incredibly stupid and poorly done. I tried about 3 different options before settling on a simple “V” in red. I think it looks cute. I only added the mouth to one of the hats to give both the boys the same feeling hat with subtle differences. 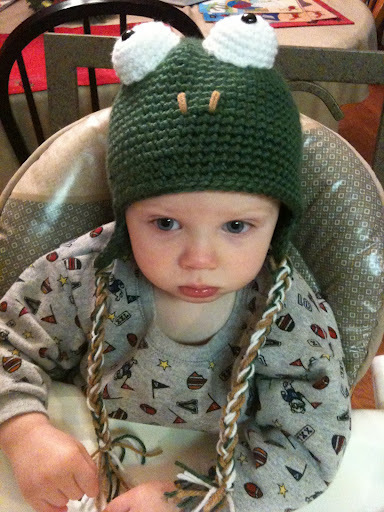 This entry was posted in frog, same, sean on December 4, 2010 by littlebirddesignsfxbg. Just a little THANK YOU to all my followers! I would like to congratulate “Incognito” on being our November drawing winner! You will be contacted with details of your prize. Just know I appreciate all my followers and wanted to say thank you just to them by having a drawing for a custom made piece of jewelry this month. Without you all my blog would just be a random journal about my crafting misadventures, but YOU give this blog meaning… So THANK YOU from the bottom of my heart! This entry was posted in Uncategorized on December 2, 2010 by littlebirddesignsfxbg.